1. The FBI raided American Indian Charter Schools’ three campuses last night in Oakland, and hauled away financial documents from the scandal-plagued schools, SFGate and the Trib report. The FBI raid came just a day before an Alameda County Superior Court judge was expected to finalize her ruling, allowing the charter schools to remain open for up to a year while they appeal their license revocation. The Oakland school board revoked the schools’ license to operate earlier this year because of a $3.8 million financial scandal. The FBI raided the schools apparently because some of that money included federal funds. 2. 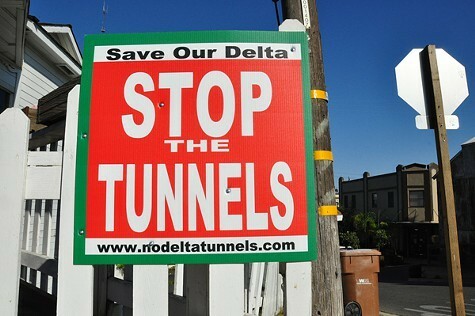 In a move that has sparked outrage in the Delta region, Caltrans is confiscating yard signs that decry Governor Jerry Brown’s plan to build two giant water tunnels, the SacBee$ reports. Caltrans officials said the anti-tunnels signs were too close to state highways in violation of California law, but opponents of the governor’s plan contend that the sign-removal effort is designed to silence their political views. 3. The pilot of the Asiana jetliner that crashed at SFO told federal investigators that he was temporarily blinded by a flash of light about 34 seconds before landing — at about the same time that the pilots realized that the plane’s airspeed had slowed too much for a safe landing, SFGate reports. Investigators are looking into what could have caused the flash of light, including whether it might have been someone aiming a laser pointer at the plane — a problem that has plagued airports around the country. 4. A trio of respected bridge engineers urged transportation officials to open the new eastern span of the Bay Bridge on Labor Day as planned and offered a quick fix that they said would make the bridge safe in an earthquake, the Bay Area News Group reports. State officials said they would thoroughly analyze the proposal — although that process could take just as long as the current planned fix for the new bridge, which is expected to be completed in December. 5. And some of the 29,000 inmates on a hunger strike in California prisons say prison officials have threatened reprisals against them, the LA Times$ reports.